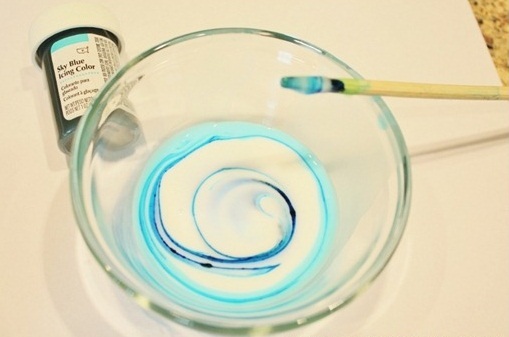 In a small bowl combine a few tablespoons of glue or Mod Podge, food coloring and a few drops of water. Experiment with the color combinations. 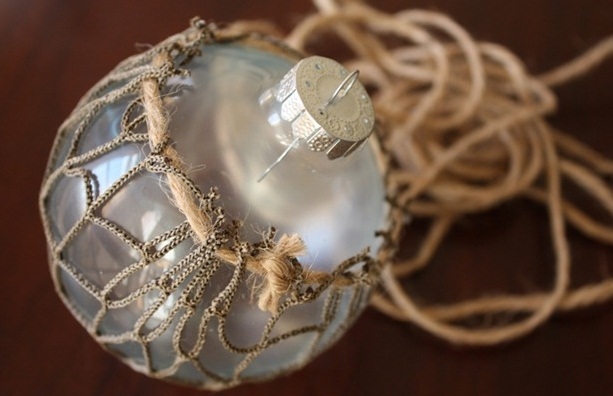 The darker your mixed color, the darker your glass float ornament will be. Next, remove the ornament top and place on a cup. 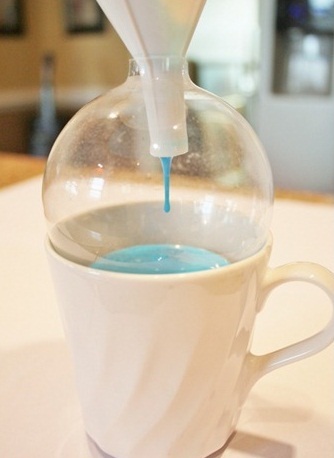 Using a small funnel, pour the glue into the ornament. The glass ornaments I had bought ten years ago!! Seriously, they’ve been sitting in a bag in the attic. So they look a little dusty inside in these pictures. I’m telling myself it will give character and a vintage look to the ornaments! 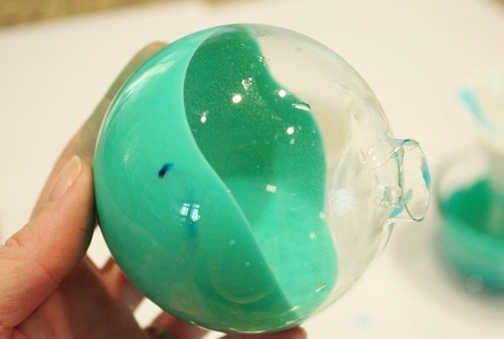 Swirl the ornament around so the glue will coat the inside completely. Be patient, this takes some time. See that dark blue spot? You do NOT want that, it will not disappear, I discovered later. If that does happen, insert a chop stick and stir the color blob until it dissolves. 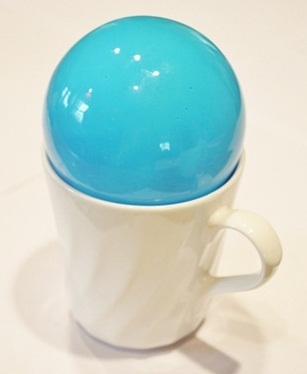 Once the ornament is completely coated, rest it upside down on a cup to drain. 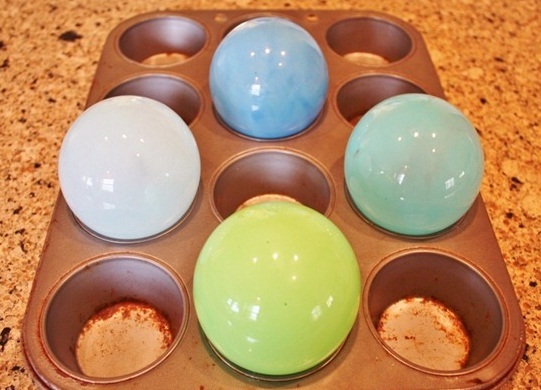 Pull out an old cupcake pan. This is one I use for crafts. Set all the ornament upside down on the pan and place in a 200 degree oven. Keep then in the oven until they are dry and translucent. This process can take anywhere from half and hour to over an hour depending on how much glue you had inside your ornaments. Glue will drain out of your ornaments into the pan. It washes out easily afterwards. I turned my ornaments upward, half way through the drying process. If you have a ton of streaking, keep it in the oven longer. There is the possibility that some streaking may remain. Each glass float ornament is different. Remove them from the oven and allow to cool. Look at that gorgeous translucent color! Isn’t it beautiful? You have the start of a glass float! Now you need a little netting. Cut enough netting to cover the glass float. Pull it up and around the float, and start weaving a piece of twine in and out the the netting and then tie a knot. Once your knot is tied, trim off all excess netting. 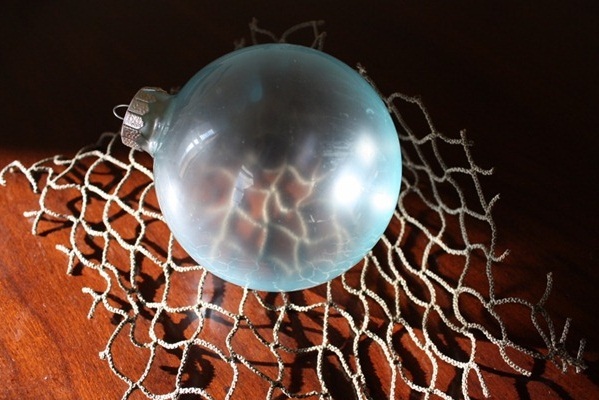 You now have a beautiful glass float ornament! 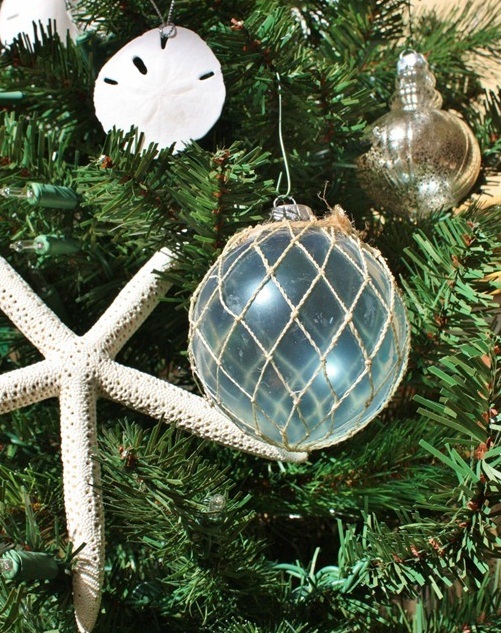 Pair the glass float ornaments with starfish, mercury glass ornaments, and natural elements for a stunning Coastal Christmas Tree!